To end my amazing trip to Chiang Mai I’ll share some of my favourite pictures that I’ve taken there. While looking through them on Lightroom, I noticed that none of the pictures features any people, which is strange – given there were so many people on the streets, lots of monks in colorful clothes, nicely decorated girls in the night parade and lots of street vendors. But somehow the colour pictures that captured most of my attention are actually those that are quiet and calm, but vibrant in terms of colours. 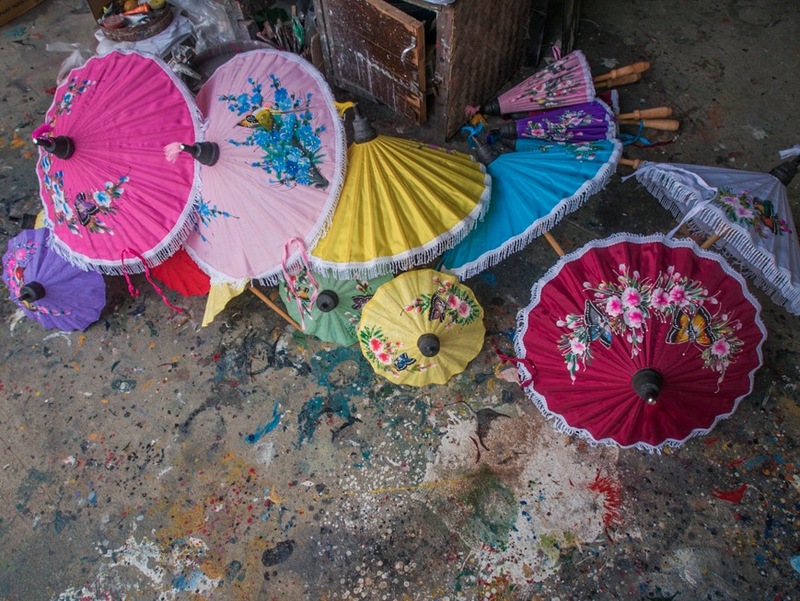 For instance, the fist picture above was taken at the Bo Sang umbrella village. Those umbrellas were just laying in the corner. They were just finished and waiting to dry. I love the different colours in this picture, but even more the dots of colours on the floor, they just belong to this picture. Next up is this elephant statue. Funnily enough, it was sitting outside the Bo Sang Umbrella Factory. I don’t know if this was a special location or why the Ganesh was sitting there, but I just liked the colours of the statue. It’s a nice picture, very simple but nice. 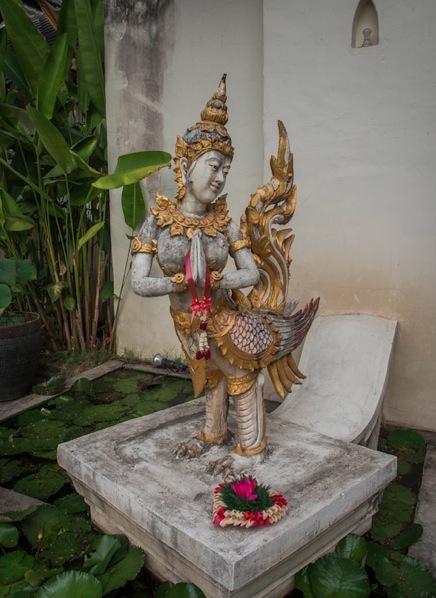 Here is a dancer statue – again, I found it standing outside the silk factory. It was just next to the entrance, greeting us and welcoming us to explore the factory. 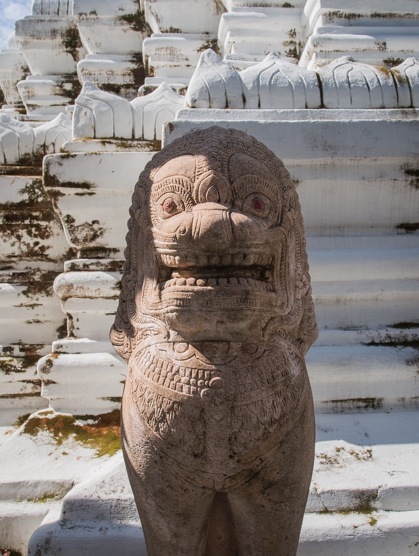 This one appears to be a lion – and the statue was at one of the stupas, in one of the many temple grounds in Chiang Mai town. I think that’s my favourite statue of all that I saw in Chiang Mai, it was so unexpected to see it in a quiet court yard in a small temple and the lion was just smiling at me. 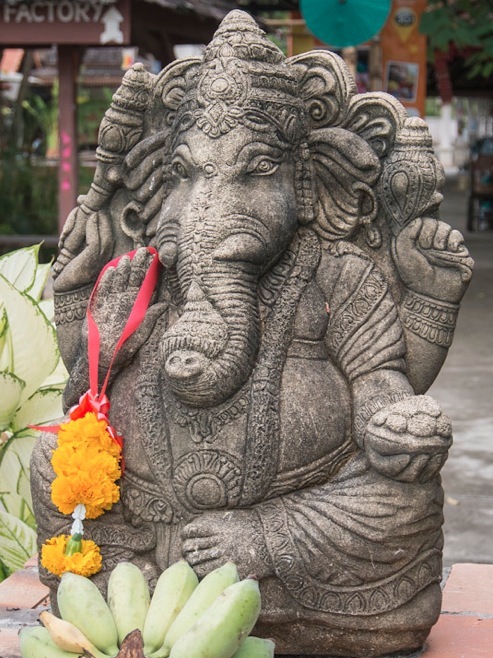 The final picture is not an animal or dancer, but it was taken in one of the many temple grounds too. It’s a row of bells and I like the colour and perspective of the picture. 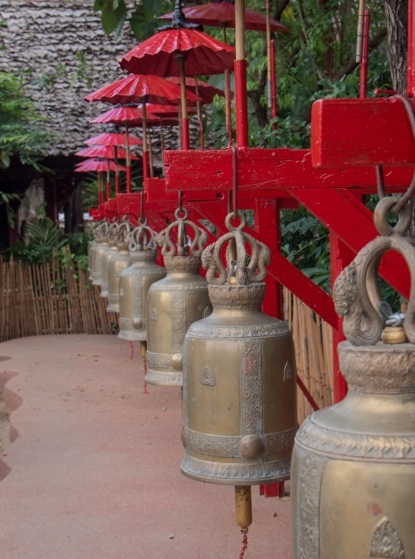 I just wish I could find out what the bells are being used for – it must be some sort of ceremony as I’ve seen different (but similar looking) rows of bells in a couple of temple grounds.